Halloween spending this year is expected to reach $9.1 billion dollars, according to the National Retail Federation, with 16 percent of consumers celebrating by dressing their pets in costumes. As a dog owner, let me clarify for the NRF. Dogs take little interest in wearing a costume unless it smells like it’s already passed through them once or twice, if you know what I mean. And I hope you don’t. 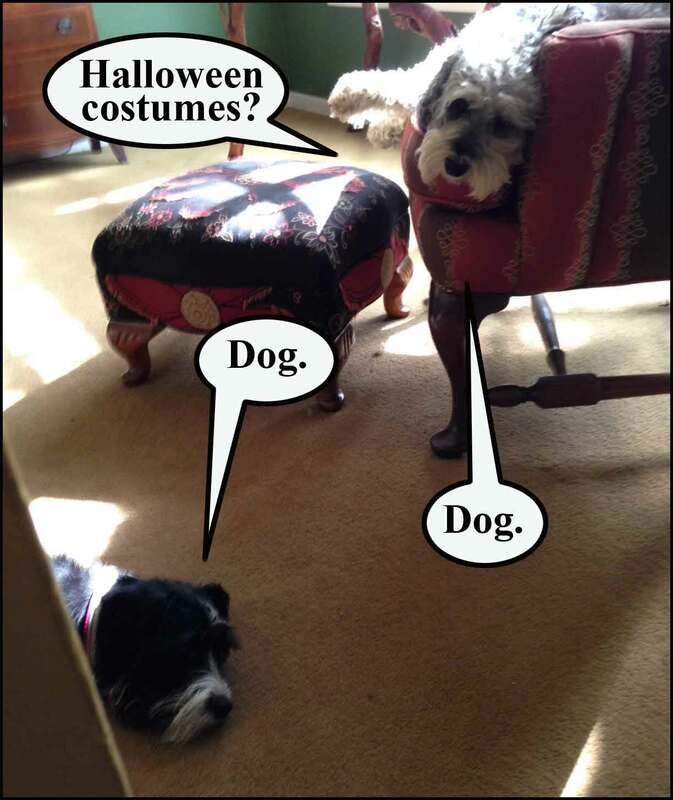 As Halloween approaches, dogs carefully manage their expectations. Dogs don’t really enjoy wearing costumes, even those constructed mostly of tuna. This aversion dates back to prehistoric times when Early Neanderthal hunters would lure prey using Early Wolf cubs wrapped in bacon, until Early Wolf mother heard about it. Then that was the end of Neanderthal. Today’s domesticated canines are more tolerant of wearing costumes, once you get the hood past their snapping teeth. However, a dog’s acceptance of a costume chiefly depends on whether or not they’re a terrier. Budleigh is our young rescue dog who, as near as the vet could determine, is half terrier and half some other terrier. Despite Budleigh’s early life on the streets boosting cars and running numbers for the Mob, he’s very social and well adjusted. But he has no intention of being put in a costume without first clearing it with our 10-year-old, baseline model, bell-curve dog, Brisby. When selecting an appropriate costume for your dog, think safety first, cautions such animal humane groups as the ASPCA, an acronym for Weapons of Mass Destruction. Sorry! It’s an acronym for The American Society for the Prevention of Cruelty to Animals, the oldest animal-protection organization in the Western Hemisphere that also has access to Weapons of Mass Destruction. The group counsels that costumes must not interfere with a pet’s movement, hearing or “ability to breathe, bark or meow.” Good advice, because if my dogs meow I need to know immediately, as does YouTube! The Society also suggests that owners try costumes on their pets before Halloween in case it turns out that, as I’ve already implied, they’re a terrier. Costumes needn’t be elaborate. A simple, cheerful, child-friendly bandana tied around your pet’s neck perfectly complements the rotting zombie Donald Trump replica decorating your front lawn. Giant 2 and I decided to go the bandana route. Brisby, a poodle-schnauzer mix, would be no problem. Nature’s Perfect Animal, Brisby splits his time between ministering to lepers, rolling bandages for the Red Cross, and eating goose poop. Budleigh would be the challenge. Tying a bandana around a terrier is no different than tying a bandana around the Death Star. Both should be attempted by someone other than you. A well-behaved terrier usually won’t bite so long as you’re relatively chipmunk-free, but they tend to be less cooperative than, say, North Korea. To win Budleigh’s trust, Giant 2 and I first dressed Brisby in his bandana – a complicated ritual that involved raising his head slightly from the pillow he was asleep on, then tying on the bandana. Brisby roused himself enough to roll us a few bandages, then went back to sleep. Now, oozing the charm of a carpetbagger we approached Budleigh, warmly assuring him that he was A GOOD DOG and A VERY, VERY GOOD DOG and A DOG WITH MANY FACEBOOK LIKES! You know how the eyes of some portraits follow you around the room? Budleigh does that with his whole body. But since he wasn’t ticking, I gently wrapped his cowboy-themed bandana around his neck, careful not to tie it unless he told me we were cool, man! Encountering no protests I knotted it, easy-peasy. Trouble started when I removed his collar. Budleigh is very fond of his collar and likes to keep it close by, much the way I like to keep my liver and pancreas close by. I think it’s the reassuring sound of the jingling tags. The ones on his collar, I mean. There are no tags on my liver or pancreas, as far as medical science has been able to determine. Budleigh took the dangling end of the collar firmly in his mouth and assured me with his sweet Buster Keaton expression that I could have it when I pried it from his cold, dead teeth. Eventually I was able to negotiate a release by way of a comforting voice, firm commands and 186,000 doggie treats. Now just days before Halloween, Budleigh has reached an uneasy compromise with us Giants. 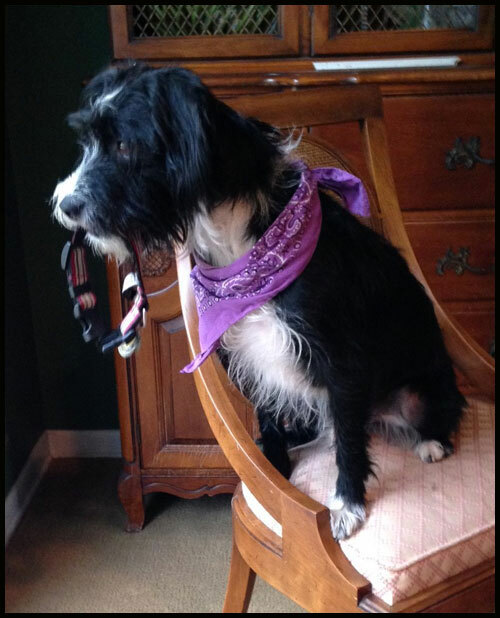 He will wear his handsome, cowboy bandana provided he can carry his handsome, jingling collar in his teeth. A big “Howdy!” from Cowboy Budleigh and his trusty sidekick, Collar! And should any wide-eyed, innocent trick-or-treaters ask, “What kinda’ costume is that, and why’s he got a collar in his mouth?” I’ll answer playfully. I am going to buy a bandanna today, wow! Or maybe wear my old balloon bow tie and carry my purse clenched in between the few remaining teeth I have. I must have some terrier blood in me.